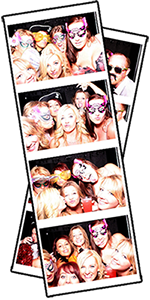 A photo booth is a must have for any wedding, holiday party, corporate event, birthday party, or really any event. It’s a great way to capture all of your guests having a fun, even the shy ones cut loose as soon as they get in there with a few friends and the curtain closes. We service the North Bay, including: Napa, Sonoma, Marin, Petaluma, Santa Rosa, Cloverdale, Healdsburg, Novato, and everywhere in between. Our attendants make sure everything’s working properly the whole time, while helping your guests and making sure they’re having a blast. Personalized Graphics at the bottom.